The Tectonics Observatory (TO) is a multi-disciplinary center at the California Institute of Technology. We aim to understand the behavior and properties of the Earth's surface and underlying layers (the lithosphere), covering topics such as earthquakes and mountain building. See below for news of some of our recent discoveries, or visit our Schools and Public Education pages. Earth's core may be hotter than scientists thought - as shown by a new method to measure the melting point of iron under extreme pressure. Jennifer Jackson's group squeezed samples of iron to tremendous pressures using diamond anvil cells, and then heated the samples further using infrared laser beams. They found that iron at pressures found at the Earth's core needs a higher temperature to melt than previously thought. 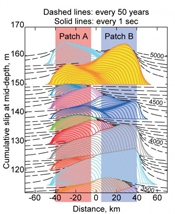 Creeping fault segments, may, in some cases, contribute to massive earthquakes - as shown by new earthquake fault models developed by Nadia Lapusta and Hiroyuki Noda. They hypothesize that this is what occurred in the 2011 magnitude 9.0 Tohoku-Oki Japan earthquake, which was unexpectedly large. Victor Tsai has won the 2012 Keiiti Aki Young Scientist Award - this award is given every year to an outstanding young seismologist who is within three years of receiving her/his Ph.D. Professor Jennifer Jackson's lab is hosting a high school teacher (Chuong Vu from Eleanor Roosevelt High School) and two high school students (Margaret Yu from Mark Keppel High School and Ed Guzman from Crescenta Valley High School) for five weeks of research - as part of Caltech's Summer Research Connection program. They are working in mineral physics, to increase our understanding of the interior of planets.